While nearly everyone in the industrialized world is practically fixated on the importance of a comfortable retirement, reality may be heading in a very different direction. Semi-retirement may be the new normal in retirement planning. A report from US News entitled Why the Middle-Aged Are Missing Out on New Jobs, highlights the reasons why full retirement is getting harder to achieve for so many people. On the surface, the article is dealing with the absence of jobs for the middle aged. But the reason it spends so much time discussing the retirement prospects of the elderly may be the more significant story. Apparently the reason middle aged workers can’t get jobs is because the elderly are working longer to delay or forgo retirement and reducing the number of jobs available to middle aged workers. That in and of itself means that fewer current middle aged workers will have the financial resources to retire when their turn comes—a vicious circle with no end in sight. If you’ve spent much time on this website in the past, you know that this is a topic I’ve written on numerous times. It’s the “B side” of the retirement discussion—the side that gets little coverage—and stands in stark contrast to far more typical analyses that are dominated by convincing projections on how a few thousand dollars invested each year will make you a millionaire living a life of luxury by the time you’re 65. At first glance, the trend toward semi-retirement seems like gloom-and-doom fodder. And while it’s true that the trend is being driven by negative factors, such as back-to-back stock market crashes, a major drop in real estate values and the absence of back-in-the-good-old-days defined benefit pension plans, semi-retirement actually holds a number of advantages over the full blown version. In fact, I prefer to think of it as a positive response to a negative set of circumstances. No need to wait until you’re 65. Most people have to wait until they’re 65 (or older) in order to fully retire because it will take them most of their working lives to be able to accumulate sufficient money to afford it. But if you semi-retire, you can actually do it anytime you’re ready. Semi-retirement becomes a lifestyle, while full retirement is a far off event on the calendar. Having more free time when you’re young enough to enjoy it. It’s common for people to envision a perfect retirement when they’ll finally be able to enjoy all of the activities and adventures they never had time for during their working years. But sadly, that retirement often occurs at the same time that debilitating health conditions set in, limiting options. Maintaining good health becomes a priority. Would you take better care of yourself if you knew you’d be working right up until the very end of your life? Probably. Unfortunately, health concerns often take a back seat to financial plans. It’s almost a self-fulfilling prophecy that we neglect our health in order to focus on saving up enough money for the time when we might not have our health. The very effort itself takes a toll on the body. If you semi retired in say, five years, instead of waiting for full retirement at 65, you’d have more time in the intervening years to maintain and improve your health. That might make the “golden years” a little more golden than having a few extra bucks in your 401K. Enforces a lower cost lifestyle. Retirement planning is hyper-focused on the accumulation of money. In fact it often seems that retirement itself is determined entirely the size of one’s bankroll. But what about living expenses—the almost unmentioned critical other half of the retirement equation? The size of the bankroll needed for retirement will fall in direct proportion the level of your cost of living. Once you lower that, many things become possible. Greater certainty. The farther out our plans, the less certain they become. A semi-retirement planned for five years out will be more certain than a full retirement set 30 years into the future. A stronger connection to the world. Few of us realize the degree to which work connects us to the world. It’s usually only post-retirement that anyone figures that out. It’s ironic that the thing we’re working to break away from through retirement is the very one that gives us much of our relevancy in life. Creates a lifelong time horizon. 65 has become one of those life’s barriers ages—once you cross it, life is never the same. There’s life before 65 and life after it. Of course, it’s all an illusion. Apart from the fact that you’ll stop working at that age, most other aspects of life will remain the same. If you’re semi-retired, there is no such barrier age. You won’t be 40 and thinking about the next 25 years, you’ll be properly thinking of the rest of your life, which could be another 40 or 50 years. That kind of time horizon could change your outlook on a lot of things. Forces us to find our life’s calling. If there were no retirement, no end to the work you’re doing, what work would you choose? If you’re waiting for retirement to relieve your work burden, this question may not be relevant to you. But if you plan to work for the rest of your life, finding and pursuing that career, business or job that you were “born to do” would become one of the most critical missions in your life. In fact, if you’re doing work you really love, retirement won’t even be necessary. Semi-retirement would force you to do this. So if we want to semi-retire sooner, rather than waiting for 65 or some other age when we’re financially ready for the full version, what should we do to prepare for it? If you don’t think you can afford to semi-retire, check out this post about a man named John. A young man, he already has what most of us are working feverishly to achieve much later in life. John isn’t semi-retired, not yet, but he’s in a position to do so. Any of us can—and it has far less to do with money than we think. Also, if you’re interested in developing additional income streams, either for retirement or to help prepare for it and fund it, check out my post on freelance blog writing. It’s the kind of work and business you can easily run well past retirement age. What do you think about the prospect of semi-retirement vs. full retirement? Do you think it has advantages? What else can we do to prepare for it? Great post, Kevin. I think you’re right that semi-retirement seems to be more feasible for people these days, especially with the market in flux and Social Security in question. Some people find that complete retirement just doesn’t work, anyway, because they aren’t used to just doing “nothing” all the time. And, as you said, because there are so many variables, so many possibilities, so many unforeseen circumstances, what you plan to do in 30 years may not be a possibility when you actually get there! But, I like your suggestions on practices you can put into place now because you’ll be able to start reaping the benefits sooner rather than later. Maintaining health, curbing expenses on toys, save money, find your calling — those are all things we should be doing everyday, anyway! But yes, everything in moderation, too. That doesn’t mean we should empty our accounts and blow all of our savings right now, either. I don’t know why we think we need to suffer through 40+ years of work so that when we are (in theory) able to retire, our most capable years are behind us. Learn to appreciate and live now. Chris – Your last point (suffering through 40 years of work) is a big one! We can obsess on preparing for the last few years of life and miss a whole lot in the process. As you wrote–everything in moderation! Kevin — Agreed on that mortality thing! It works both ways, too. You could spend all of your money now and figure you won’t see retirement age, then you end up living to be 100! Plus, with retirement age going up periodically, I wonder what it will be when I’d be ready to retire. Semi-retirement, here I come! As always, thanks for your great posts! The potential for a greatly increased retirement age by Social Security would be a strong argument in favor of semi-retirement. If they end up raising it to 70–which I think is coming–I’m not sure a lot of people’s health and sanity will hold out that long! Thanks Brad. Actually I mostly think of this as turning a necessity into a virtue. I don’t think most people will have the golden retirement, and if that’s the case we need to have another plan. And not just a plan, but one that will offer the quality of life that we’ve always wanted and isn’t defined by a date on the calendar or by a certain sized bankroll. I agree semi-retirement is definitely the way to go. I recall an interview with Clint Eastwood that I read a few months ago with regards to retirement. He said his father retired just after the great depression. His father was looking forward to retirement and he passed away only a few years after. Clint believes if you are doing something you love then it isn’t really work. He directed and was the star of Gran Torino and he did an amazing job. I know not all of us have a glamorous career in Hollywood, but there are definitely benefits to semi-retirement. You did a great job laying out the pros. Rafael – Thanks for the compliment. Somehow I think that once we let go of the need to one day “cash-out” we also increase the chance of finding our passions. The idea of living life with a deadline (like retire by 65) goes against that, and also strikes me as somewhat unnatural. That said, I do plan on becoming semi-retired some day. I think it’s a great way to approach it personally. Not so much from a need to work standpoint (but who knows…), but more from a contribution to society and avoiding boredom standpoint. Great article, I enjoyed and agree strongly with your stance on full vs semi retirement. MR – Thanks for weighing in. Actually in writing this post I was surprised that I hadn’t realized much of this sooner. I’ve known people who slowed down and semi-retired early in life and they seemed to have what everyone else is working for. At the same time, there are people who did traditional full retirement and found out it wasn’t what they thought it would be. LOL Kevin, I don’t see myself retiring = hate being bored. But if I had enough money to do stuff, I guess I could volunteer and travel. I am hearing of more “retirees” retiring several times – retire from one job, go get another and so on (lol). Smart individuals. Great subject! My Blog: A Story of Hope! Angela – I think that’s kind of the moral of the story, to blend work and the rest of life. Maybe there are times when we need to do the work hard/make money thing for a time, then shift to the kick back/live life/tend to personal business thing at others. It would be great if we could neatly blend both, but sometimes life doesn’t give us that option. Plus I tend to think that the hyper-multi-tasking we’re being forced into these days is wearing us down. Which will be the subject of un upcoming post! It’s the same in the UK. Many people will have to keep working at least part time well past oficial returement age. Blogging seems to portrayed as way to fund this semi-retirement. 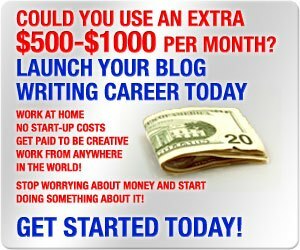 While it is possible to make money blogging, it’s not going to be the case for everyone who decides to start a blog. Hi Karen–That’s true about blogging, it won’t work for everyone. But the web has become the place to make money in our day and time, or to at least help it happen. And the other point to consider is that it will take most people several tries at developing a successful business of some sort, and for that reason it’s best to take advantage of the time between now and your desired retirement date to experiment and find what works. And along the way, blogging or something related, is something worth trying. It’s not always blogging that generates the revenue either. Sometimes blogging leads to other ventures that create income streams. The web has certainly become a place where “make money blogging” ebooks, subscriptions etc make money for some bloggers. I’ve been telling people this for years that I would never retire but rather do as you say semi retire. A lot of people look at me like I’m crazy when I tell them that but your exactly right most people can’t build the portfolio needed to sustain a full retirement. Back when I was working in financial services I actually had one person ask to start saving for his retirement at 59. I think some it comes down to poor spending habits in our younger years but also due to the fact most people don’t start early enough planning for their retirement. Hi Chris–I think that most people underestimate what it will take to have a full retirement, and will be forced into semi-retirement as a result. In truth, it may not be worth the effort (full retirement) since most people have greater immediate needs. It’s not that I’m I’m being flip about retirement planning, only that I’m stating the reality that most people don’t/won’t have the resources and need a strong Plan B.
I plan to semi retire next week at age 59 and a half !!! Hi Susan – Good for you. I’ll bet you’ll live longer and enjoy your life more as a result. I read a lot of financial magazines/publications and I just hate it when they have an article giving advice on how to make ends meet in retirement and the say to work when retired. Excuse me but if your working, you ain’t retired! Semi-retired is a much more appropriate term. A big problem is that many people live above their means while still working and if they can’t make it on full salary, then they sure as heck won’t make it on reduced salary. I do know a couple of people who retired on a defined benefit pension and they worked part time after leaving their first career. They actually make more money now than when they worked full time. Hi Kathy – We can debate the reasons why people can’t fully retire all we want, but statistically speaking, most people won’t be able to retire completely. That’s the purpose of this article, to address that very large group. I also believe that a lot of people think that they’ll retire on some kind of magic, which is to say that they THINK they’ll be able to fully retire on Social Security. I guess you can only think that if you have blinders on, but we have to suppose that a lot of people do. And I also agree that it’s completely possible that a person could make more money in semi-retirement than when they were working, from the combination of earned income with retirement income. I actually saw that happen in my accounting days. This is especially true for the self-employed, many of whom will never retire, because they can’t quit on themselves. Retirement is an entirely different ballgame for the self-employed.